Preparing a cash flow analysis often gives managers a much better understanding of the operation of their business. It is particularly important for some small medium businesses to get an understanding of cash flows because they are especially vulnerable to problems dealing with cash. Smaller businesses tend to operate with inadequate cash reserves or none at all. Perhaps the most critical element to be considered is the timing of cash flows. If all of the cash outflows occur in the first six months and most of the cash inflows occur during the second six-month period, the business may fail before it has an opportunity to receive sufficient cash inflows to sustain itself. Timing of flows is critical. Decreased liquidity. Running out of working capital. Some symptoms include too little inventory to meet demand and stretching payables. Excessive turning. Turning inventories over more than other businesses of comparable size in the industry. This can be an indication of good management, but in extreme cases it may be caused by too little working capital to support adequate inventories. Dropped discounts. Past-term payments and failure to take advantage of timely payment discounts could indicate poor management of payables or the lack of cash necessary to pay in a timely way. Slow collections. A high percentage of old receivables probably indicates poor management of receivables. It certainly indicates a potential cash problem. These problems may be caused by insufficient cash, or the insufficient cash may be the result of poor management. In some cases, low cash balances might even indicate a planned result. For example, rapid inventory turns may be advantageous. In the grocery business, with a low margin per sale, the more frequently sales are made and inventory is turned over, the more profit is earned. Thus indicators of cash flow problems may signal nothing more than that further investigation is warranted. The control of cash is not mysterious, nor is the process itself complex. What is required is a systematic and organized approach. A few simple guidelines, set out in the next eight steps, help organize the process. Identify all your sources of cash inflows: operations, debt, sale of assets, and investment. List the uses to which you put the cash. Identify the timing of cash flows, both in and out. Calculate the difference between cash inflows and cash outflows. It is important to identify time delays in receiving cash. Identify any bottlenecks to getting cash in quickly and determine how to open up the inflow. 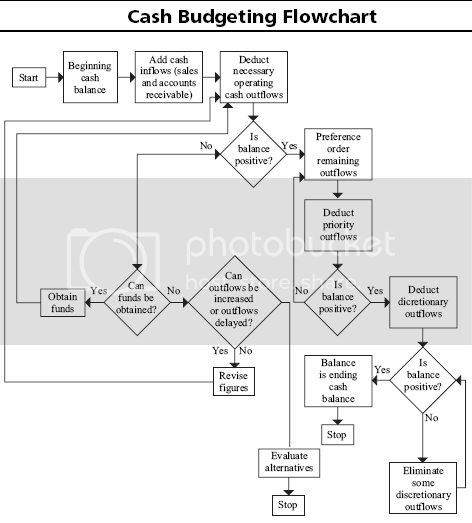 Enumerate any constraints on the use of cash, such as bank loan covenants. Identify those cash inflows and outflows that can be rescheduled or whose timings may be changed. Most important, establish a plan for positive cash flows. This step cannot be accomplished until the other seven steps have been completed and analyzed. Each of these steps will require time and effort to complete. However, like most planning, the rewards in the long run significantly outweigh the costs to gather and analyze the information. It may save your business. New investments and debt are sources of cash. However, they are infrequent and cannot be relied on as continuing sources of cash. The sales of fixed assets are like new investments. The sale of fixed assets is not a source of recurring cash. You can sell the asset only once. While these sources cannot be ignored, they are secondary to operating profits. Consequently, it is important to focus on operating profits as your main source of cash. It should be noted, however, that operating profits probably will not be the source of capital for major plant expansions. Operating profits, unlike new investments or debt, are ongoing and also harder to track. They must be monitored and controlled constantly. Even growing businesses, with increasingly larger amounts of cash inflows, must review the budget and related variances periodically and maintain control, or they may suffer from shortages of cash. As your business grows, you will often suffer from liquidity problems. Such problems may cause your business to fail to meet its short-term obligations even when it is quite viable and profitable. As you advance through the business or product life cycle, cash demands will vary with the stages of the cycle. In periods of fast growth, the business probably will need growing inventories, receivables, and transactions cash. These inventory growth periods demand the commitment of large amounts of working capital, much as would be the case for adding to a building. Notice that inventory turns improve as more sales produce faster turns. Also notice that receivable turns degenerate as sales are made to marginal customers and staff is not available to perform proper credit checks and follow-up. Unfortunately, these are typical scenarios. Assume that these numbers are indicative of trends in many businesses and could apply to you. On sales of $1 million with profits at, say, 15 percent of sales, you generate $150,000 to contribute to your working capital needs. On sales of $2 million (assuming you have to “deal” to get the other sales), your average profit percentage drops to 13 percent, so you generate $260,000. Your working capital needs increased by $280,000 ($490,000 ? $210,000) while your profit contribution increased by only $110,000. How do you finance this growth? The “fixed” working capital issue is that there is some minimum amount of investment in working capital that is required and should be financed as a long-term asset, not on a short-term basis. In our illustration, if base sales stay around $1.5 million with peaks and valleys, then the “fixed” component of working capital is about $340,000. Rather than being a source of net cash inflow, the period of rapid growth may be a problem period. In periods of fast growth, inventory, receivables, and so on might not only consume all of your profits but might also require debt financing. Part of the problem might result from offering extended payment terms to customers while at the same time being required to pay material suppliers on short terms. This difference between the time when you must pay suppliers and when you receive payment from your purchasers could mean the difference between continuing to operate and having the business fail. The problems just outlined in regard to the increase in working capital that are associated with rapid growth may also arise in a company that is not growing at all, but for different reasons. For example, a company’s investment in inventory will increase if the purchasing staff is buying parts in excessively large quantities, if finished goods are not being sold, or if the engineering staff has made a number of parts obsolete by switching to new parts on existing products. Similarly, a more liberal customer credit granting policy or a weakened collections effort will increase the investment in accounts receivable, whereas taking early payment discounts will reduce the amount of accounts payable outstanding. Since any of these issues can arise at any time, no matter what the growth stage of a company, it is best to monitor changes in the balances of all working capital items on a weekly basis and immediately investigate the reasons for sudden jumps in the investment in this category. Otherwise, a company may find itself in need of far more cash than its cash flow forecast would lead it to expect. A good place to start considering cash outflows is the cash journal or, if you don’t have one, the checkbook. The important activity for this step in the process is to determine where the cash is going. Many businesses experience lengthy delays between the time they pay for goods for resale and when they actually receive cash from the sale. To some extent, the delay is unavoidable. By analyzing the delay, however, you can plan for the amount of cash necessary to sustain this short-term investment in inventory and receivables. Can we get along without it? Can we postpone this expenditure? Would it make more sense to pay for it earlier or later? Can it be done less expensively? We often get into the rut of believing there are only two ways of doing something: our way and the wrong way. People typically act according to habit simply because doing so takes less mental effort than to think out every action in the day. The way to be innovative is to ask why. Why do we have a 45-day acceptance period? Why do we have a 30-day credit period after acceptance? Why does it take so long to deliver the product? Why do we carry this item in inventory? The answers to these questions may save both expense and cash immediately. If you cannot determine where the cash is going, it may be necessary to consult your accountant and get help establishing controls. However, for many small businesses, a checkbook can provide adequate daily records of cash disbursements. Continue to list those items for which cash is expended until you are sure that you have accounted for all of the periodic expenditures that occur annually. times for some of these items. A positive cash flow period is one in which the inflows of cash exceed the outflows of cash. This may not happen in all circumstances. However, it should average out over the year. For any operating period in which the business experiences a negative cash flow period, funds must be obtained from some other source. Negative cash flow periods will occur occasionally—for example, during growth spurts. Many businesses experience sales rhythms. If you are experiencing such a rhythm, look to see if it is typical for the industry. In such cases, you must understand the rhythm and time-discretionary cash inflows in order to properly plan for those periods in which you may experience a negative cash flow period. Understanding the phenomenon of delayed cash inflow as a result of growth will help to determine how fast the business can afford to grow. It may be better to sustain a slower growth rate in order to avoid significant negative cash flow problems. By looking at the timing of cash inflows and cash outflows, you may find ways to improve profitability by both cutting costs and increasing your opportunities. Plan payments to maximize the utilization of cash. That is, consider extending payments for as long as practical without incurring adverse consequences from the creditors. Everyone in business knows that the way to improve cash flow is to slow down the outflow of cash while speeding up the inflow. This is particularly true in a tightening economy. However, before blindly following this path, consider the consequences of slowing down payment to vendors. In business, terms for payment are still commonplace. In fact, 2/10, N/30 is a commonly offered discount. In order to monitor discounts taken and discounts missed, you should establish a regular reporting mechanism to control this process. In this way, you can effectively monitor performance. The intent of discounts is to encourage early payment. But what are the consequences of not taking the discount? Let’s assume a 2/10, N/30 discount. For one thing, if you wait the full 30 days to pay, you are still incurring, in essence, a 36.9 percent annualized interest rate on that money. Even if the payment period is extended for a full 50 days without adverse consequences from the vendor, you have merely cut the interest rate to 18 percent. This figure is derived from the following relationship: Under the 2/10, N/30, you receive a 2 percent discount on the money due if you pay within the first 10 days. However, in the event you wait the full 30 days to pay the bill, you incur interest of 2 percent of the amount due for holding the money for an additional 20 days. Because there are approximately 18 such 20-day periods per year, the annualized interest rate of 2 percent per 20 days amounts to an annual interest rate of 36 percent. This is hardly an equitable interest rate to incur for borrowing money for such a short period. Even if you extend the period for a full 50 days, you are, in a sense, borrowing at 2 percent for 40 days. Since there are approximately 9 such 40-day periods per year, the 2 percent for each of these periods amounts to 18 percent per annum. Most businesses can afford to borrow from a bank at less than 18 percent interest. Other consequences may result from delaying payment for up to 50 days. The creditor may institute proceedings for collection. But even if it doesn’t, you will not become a favored customer by holding the vendor’s money for a 50-day period. In times of tightening economies or shortage of the materials provided by this vendor, the slow-paying customer will not sit high on the list of most favored customers. You may find shortages of necessary materials or none at all coming from that vendor if you are more costly to do business with than other customers. Do not buy necessary material too early; buy no unnecessary materials at all. Plan your buying to balance needs with some measure of safety stock. Pay so that unnecessary costs are not incurred. In doing so, consider vendor relationships and the interest rates associated with early payment discounts. Set up an accounting system to monitor discounts lost or not taken. Most accounting systems list discounts taken. While this has some benefits, you will fail to take advantage of the opportunity costs. These lost opportunities may, in the long run, be more important than discounts taken. Since it should be policy to take discounts, exception reporting would dictate capturing discounts lost. Many payments made periodically by the business may not be rescheduled. In addition, collection policies might fail to achieve their objectives. Identify the extent to which payments and receipts are inflexible. Consider methods intended to speed up cash inflows. It is possible to identify particular clients who are for the most part reliable in payment and others who are dilatory. It may be more profitable to discontinue sales to purchasers with late payment records than to continue to provide them with goods. Remember, in shipping goods to a purchaser, you are in effect loaning that purchaser money. Those goods represent a cash investment by you and can be considered a loan to that purchaser. An important consideration here is to establish a credit policy. Having a credit policy and exercising that policy consistently is a major point of control. Before extending credit, you have the maximum leverage on a particular purchaser. Once credit has been extended, much of that leverage is lost. Although there is legal recourse against the purchaser, that will not improve the cash flow in the short run. Have a business collection policy that everyone understands. Know your legal rights when it comes to collections. Know the legal restraints and conditions when offering credit. The older the account gets without payment or collection, the less likely you are to receive payment or make collection. The age of the account has a direct effect on the efforts that must be made in collecting. You may want to establish rules for termination of further shipments based on the age of receivables. When establishing a collection policy, consider these points. Categorize the steps you wish to take in making a collection. This may include “first letters,” first phone calls, referral of the collection to the legal department, and so on. Do not establish fixed time frames for advancing from step to step. If the time frames are known, many customers will wait to pay until the last possible moment before you move on to the next collection step. Do not be predictable in collection efforts. Once your collection efforts become normalized, debtors will behave accordingly. By identifying those cash inflows and outflows that can be rescheduled, you may be able to balance payments and receipts to avoid unnecessary negative cash flow situations. Sometimes talking with your creditors and working out payment schedules that meet your needs and theirs can be an effective compromise. A surprising number of banks and large companies are willing to work out such payment schedules, because a smaller payment that can be expected with some degree of certainty is preferable to uncertainty or no payment at all. Also, if creditors know that there may be a nonpayment period, they are able to work out their own cash flow requirements to not be adversely affected. Very often, businesses get into trouble with their accounts payable. You may end up spending more time talking with the people to whom you owe money than you spend in producing the money to pay your bills. This can become a cycle that gets you deeper into trouble. The solution may be to sort through all the creditors and identify all the small bills under some particular cutoff. Creditors of less than the cutoff can prompt as many phone calls as the large creditors. Often it is less expensive to borrow an amount of money and pay off all of the small creditors than to try to pay off each one separately. In this way, time becomes available to get back to the business of earning money. The bank may be able to help you out of short-term financial problems. Often grouping together many small bills into one large bill with a fixed payment period may resolve some of the intermediate cash flow problems. Building in an interest payment (perhaps lower than the penalty or interest due on all the small bills). Paying off many non-revolving accounts. This may encourage the incurring of further liabilities on these accounts. In doing so, you simply restart the cycle. Trade associations may be good sources of information on how to improve the business’s cash outflow and inflow picture. Other businesses in the same industry may have had similar experience with collections and have ready advice on how to improve collections. A major tool available for planning cash flow is a cash budget. Cash budgets involve projections of future cash needs as well as cash receipts. This budget reveals the timing and amount of expected cash inflows and outflows over a particular period. For example, most businesses use a one-year business cycle. You may want to consider a two-year cash budget with modifications to the second year’s budget after significant experience in the first year. The cash flow budget should take into account seasonal variations in sales and cash outflows. If cash flows are extremely volatile, short time period increments should be used in the budgeting process. If the budgeting shows a more stable period, the time periods may be longer, depending on the stability of the data. Remember that the farther into the future you try to predict cash flows, the more uncertain the forecast is. The cash budget is only as useful as the accuracy of the forecast that is used to make the predictions. If your cash flows are subject to high levels of uncertainty, you should provide for either a cash cushion, ready borrowing, or both.